Lindsay Whalen reacts to being fouled. Photo by Aaron Lavinsky/Associated Press. 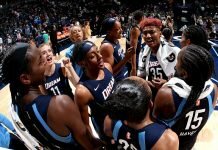 Minneapolis – A dominating, balanced effort by the Minnesota Lynx propelled them past the Los Angeles Sparks, 85-76, Wednesday for their fourth WNBA Championship. 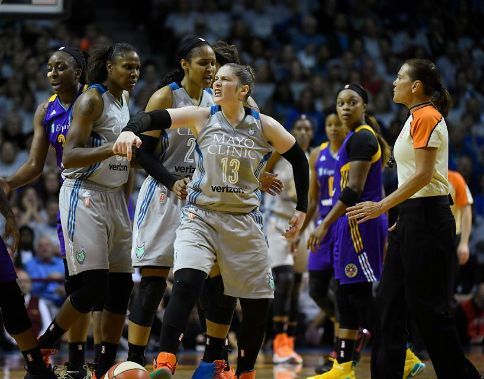 The Lynx have now tied the Houston Comets for most titles, after dominating the Sparks on the boards, 46-29. Regular-season Most Valuable Player Sylvia Fowles was named the Finals MVP after a 17-point, 20-rebound performance for Minnesota that saw her eclipse her own rebounding record. 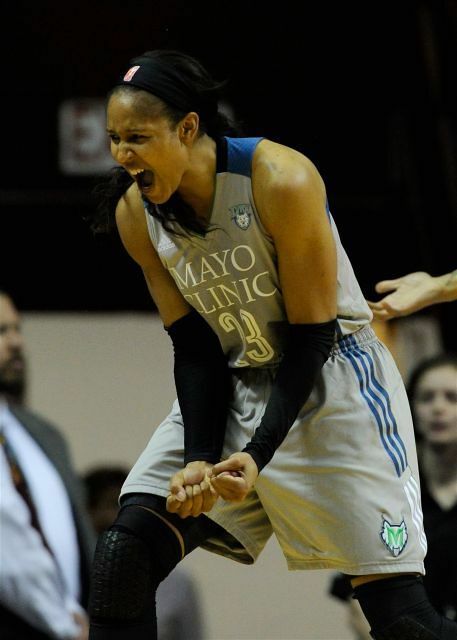 Maya Moore also had a double-double, with 18 points and 10 rebounds, and the team’s other three starters – Lindsay Whalen, Seimone Augustus and Rebekkah Brunson – also scored in double figures with 17, 14 and 13 points, respectively. 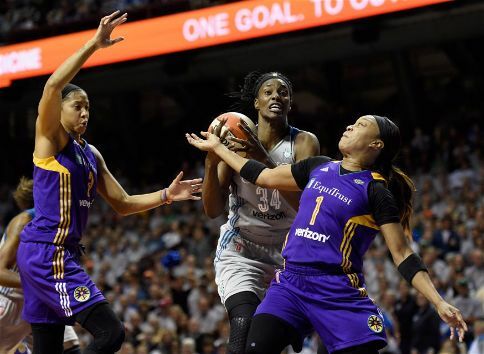 Sylvia Fowles rebounds against Candace Parker and Odyssey Sims. Photo by Hannah Foslien/NBAE via Getty Images. The Lynx had a 79-67 lead with 90 seconds to go, when Jantel Lavender scored for the Sparks. Riquna Williams made a pair of free throws and Odyssey Sims stole the ball twice for layups, which pulled them to 79-76 with 35 seconds to go. But Moore made a bucket and Fowles rebounded a missed shot from Sims to secure the win. It was the second consecutive Finals series that featured the two teams, in almost a replica of last year’s games, with Los Angeles taking Games 1 and 3 and Minnesota winning the second and fourth games. This year, however, it was the Lynx, with the oldest team in the league, that mustered the fire in Game 5 to down a team that was even better than the one that took last year’s trophy. Fowles said she was motivated by her own lack of rebounding in last year’s fifth game. 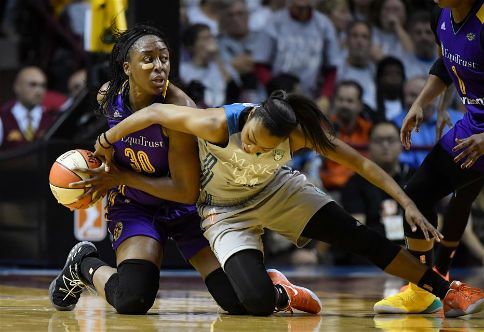 Renee Montgomery tries to strip Nneka Ogwumike of the ball. Photo by Aaron Lavinsky/Associated Press. Coach Cheryl Reeve said it was especially meaningful to win the title at home, in front of a sold out crowd of over 14,000. Maya Moore exults after a call on the Sparks. Photo by Hannah Foslien/NBAE via Getty Images. 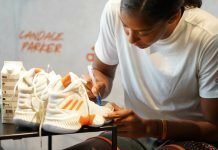 Candace Parker led Los Angeles with 19 points and 15 rebounds, while Chelsea Gray had 15 and Odyssey Sims, 14. Nneka Ogwumike scored 11 points before fouling out in the fourth quarter. It was the second straight game where the Sparks tried to catch up after falling behind early. Parker said that while losing Ogwumike was hard on the team, it was the rebounding differential that cost them the game. Players from both teams said this was the most evenly-matched series they’d played in. Going into Game 5, each team had tallied 908 points over the last 12 games against each other. Brunson has now won five WNBA Championships – four with Minnesota and one with the Sacramento Monarchs in 2005. Fowles became the fourth player in league history to win both a regular-season MVP and Finals MVP award in the same year. She is the seventh player in league history to win both MVP and a title in the same season.